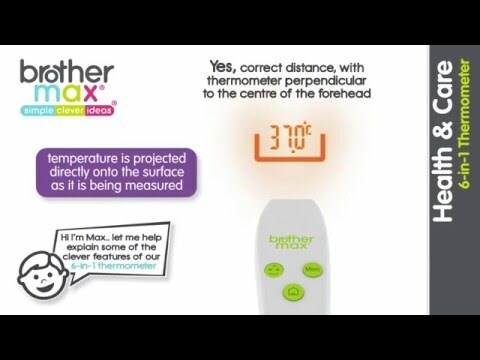 The Brother Max 6-in-1 Projection thermometer is non-contact, silent and easy to use, making it perfect and suitable for the whole family. It can be used to measure your child’s temperature at first sight without contact as it projects the illuminated temperature reading from the thermometer onto their forehead. The illuminated projection function also makes taking an accurate reading simple, with its unique built in ‘aiming’ system. Simply ensure the projection is pointing onto the desired reading surface, directly centered in the outer cradle. This will guarantee the right distance is achieved to give the most accuracy and reliable reading. The 6-in-1 Projection thermometer can also be used to measure bath water, liquid, room, food or skin (body) temperature, measuring from 1-80 C. The handy memory function also stores the last nine previous readings. Point the thermometer towards an internal wall surface. Press the FACE and HOME button simultaneously. Once the word CAL is in-between the guide-marker, release the buttons. The projection then will flash slowly showing the room temperature. Press the FACE button to take a forehead temperature reading. Press the HOME button to take bath water, liquid, room, food or skin temperature readings. Press the MEM button to access the memory function and read up to nine previous temperature readings.